Happy Thursday everyone! I think we all agree that everyday is a great day for coffee! Each day our team of baristas carefully crafts each of your favorites. Lattes, americanos, cappuccinos, mochas, cold brew. You name it, we make it. Many of you have come to know us well here at Soul, but maybe you haven't met everyone or perhaps you haven't visited us yet. So let us introduce you to our team! Meet the people who carefully and lovingly craft your drinks, learn a little about the behind-the-scenes at Soul, and maybe even hear about a new drink or two! We would first like to introduce you to Brooke Pilcher, our very first employee! She has been with us since Day 1 and is such an integral part of the Soul family. Brooke is one of our local ladies, originally from Fairhope. Eric, Gabe, Lynne, and I met Brooke through some good friends of ours not long after she moved back to the Eastern Shore, after graduating from Troy University. With a Hospitality, Sport, & Tourism Management degree, Brooke has brought so many great things to the shop, and has been such a blessing to us far beyond brewing espresso! 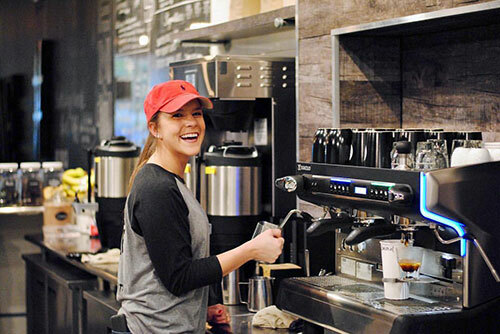 In addition to her work here with us as a barista, she also teaches dance and runs an event management company, X-Stream Events, that focuses on fun, community, and character development. Many of you may have attended one of the several lacrosse tournaments she has run in south Alabama and northwest Florida. Brooke is one very busy and equally talented lady! We sat down with Brooke and asked her about some of her favorites here at Soul Caffeine. Thanks for spending a few minutes with us today and meeting our first barista, Brooke. Stop by Soul Caffeine and say hello! See you soon!